Today is the longest day of the year, and I do not plan on spending much of it inside. It's a glorious day in Wine Country, and I am looking forward to a simple afternoon of some time spent pool side in my new bikini, and a little research with my new Steven Raichlen book, Planet Barbeque. I get to interview Steven tomorrow, I am sooo excited! Today's bento is simple. I did both nail art and a bento box this morning, so I had to keep it pretty basic. 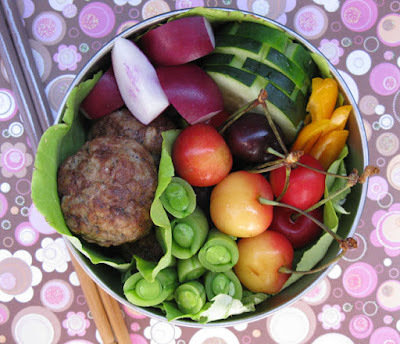 In my magic round bento box: slices of cucumber, vibrant purple radishes and sugar snap peas from Crescent Moon Farms, orange bell pepper slices, lettuce from Ridgeview Farms, cherries from Hamlow Ranches, and three teriyaki chicken meatballs from Aidell's sausage. 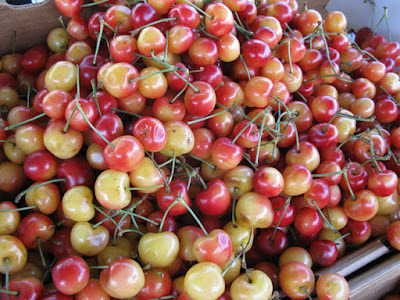 Look at the lovely rainier cherries from Hamlow Ranches. Oh, they are so yummy! Get them now, because the cherry season is achingly short. And here's the nail design I did today. It matches my t-shirt. Julius the Monkey is one of my favorites. 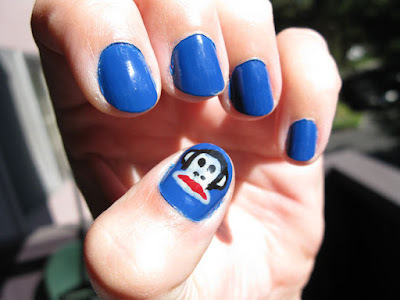 Paul Frank is so creative.